Home / Food / Sjaak’s Organic Chocolate for Easter! Sjaak’s Organic Chocolate for Easter! When I was a little girl my grandmother says I used to come into her house and that no matter where she had hidden the chocolate I could find it. I was a chocoholic from a very young age. I still believe that there is nothing better than a smooth, sweet, wonderful, creamy piece of chocolate in your mouth. Now, I like good chocolate, not your run of the mill things either. Organic chocolate has a flavor to it that is so much more pure than any other type of chocolate that I have ever eaten. Don’t get me wrong I will eat the non-organic chocolate, but I prefer organic. Sjaak’s sent me an assortment of Easter chocolate goodies to try to to let you all know what I thought. They sent me three different things to check out, any of which would be a great addition to an Easter Basket or even be a great gift on their own! This was an amazing piece, I love that they used two very different flavor profiles and put them together. The fruity gummy bears with the chocolate is really an amazing combination. Getting to the fruity bears was just as fun as eating them. It was just fabulous to get to the great fruity flavors that after eating the chocolate. What can you possibly do wrong with these two flavors? I always have such a hard time trying to decide if I want caramel or peanut butter with my chocolate and the two by Sjaak’s Organic chocolate was another toss-up, both fantastic. Chocolate creamy and smooth, and the caramel was so decadent I could almost just eat it by the bowl full. I love a great caramel and the one thing that makes it better is fabulous chocolate to add to it. I don’t know who first put peanut butter and chocolate together, but I would kiss them if I could. These two flavors just meld and blend in such a way that there is really no way to do them wrong. These came in a foil wrapped half chocolate egg that was as delicious as it was clever. I loved this. I loved this product as a gift for a teacher or a good friend that you may want to get something for. The peanut butter filling by Sjaak’s was so smooth and well, peanuty! 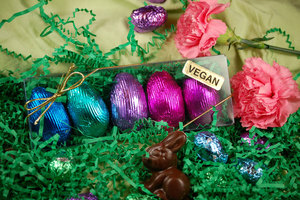 Sjaak’s Organic Chocolates is a vegan facility. That means we use no animal derived ingredients in our factory, which include no eggs, gelatin or dairy. We state that trace amounts of dairy protein are possible due to our ingredient suppliers facilities possibly containing these ingredients. We use various tree nuts and peanuts in many of our products. If you have an allergy please use caution, if you have a severe allergy we recommend refraining from consuming Sjaak’s products. We use no gluten or corn in our facility. Our products are not batch tested therefore there is the possibility of containing trace amounts. Please refer to individual product label ingredients for specific product ingredients. You can purchase these great chocolates along with quite a few others at the Sjaak’s Organic Chocolate website and their Facebook. You will be amazed at the quality and flavor of these chocolates! Next post: $20 Amazon Giveaway! SJAAKS Candy Giveaway - Here We Go Again...Ready?